Cranium Party Board Game by Hasbro in Excellent Condition . Condition is Used. Dispatched with Royal Mail 2nd Class. I have put this as used as it's not sealed but it has NEVER been played it was only opened. All items as you can see from photos are brand new not creased and unused. You will receive exactly what you see. I have photographed every element of the game and all aspects of box. Slight fading on one edge of the box. From an exceptionally clean pet and smoke free home. Scrabble is a classic battle of wits and words where every word counts. 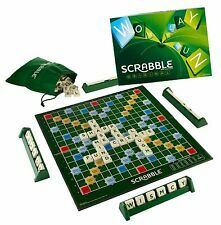 Designed for two to four players, in Scrabble you must make the word you can using any of your seven letter tiles drawn at random. Each turn a card is read out and every player writes down their own made up answer. The hilarity really starts when all these phony answers are shuffled up with the real one and read aloud (Keep a straight face so you don't give away which definition is yours!). FOR SALE IS ABSOLUTE BALDERDASH. AND IN LOVELY CONDITION. WHICH IS COMPLETE. Everyone then tries to pick which is correct. Played in two or more teams. With five points available during each turn you can soon start to ‘Jump’ up the charts, waving ‘Bye Bye Baby’ to your opponents as you go. Are you a genius at Pop and Rock Trivia?. Great fun for all the family, and has never been opened. In perfect condition and from a pet and smoke free home. Catch Phrase the DVD game. Condition is Used. Dispatched with Royal Mail 2nd Class. Find out who the weakest link is in your family or group of friends. Suitable for 3-8 players. Didn’t see the show, don’t worry instructions are included. Hasbro Speak Out Party Board Game. Condition is New Unopened. Survivor Trust No One Factory Sealed Board Game Ages 12 4-8 Players. Condition is New. Message me with any questions. Many thanks. The laughter continues as players try to decipher what in the world their teammate is trying to say, and must correctly guess the phrase in order to earn the card. All our reconditioned products may vary slightly and this is also reflected in the pricing. Hilarious fun for family and friends. Includes 200 double-sided cards for lots of phrases. Used once only. Very good condition. 100% complete very good condition. Hasbro Speak out Party Board Game (C2018). 10 Mouthpieces Condition is New. Dispatched with Royal Mail 2nd Class. 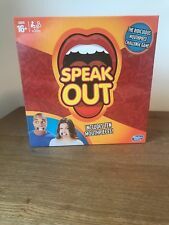 Speak Out is a party game for family and friends by Hasbro. The game contains 200 double-sided cards, 10 mouthpieces and a timer. The players are divided in teams, team mates have to try to say the phrases on the cards while wearing a mouthpiece that won’t let them shut their mouth while their team mates have to guess the phrase. The game is recommended for players over 16 years old and can be played in a group of 4 or more people. Hasbro Speak out Board Game Kids V Parents. Condition is New. Dispatched with Royal Mail 2nd Class. Hasbro Speak out Party Board Game (C2018). Condition is Used. Dispatched with Royal Mail 2nd Class. Deluxe Edition for Adults. Non-Faulty Goods. By Drumond Park. Double your traffic. Brand new - still with plastic cover over. Mouthpiece Makes Speech Sound Ridiculous. Rush to win! Who can gobble the most balls with their hungry froggy friends. Up to 4 players. 1993 vintage edition of Go For Broke board game by MB GAMES. Condition is Used. Dispatched with Royal Mail 2nd Class. Hasbro Speak out Party Board Game (C2018). opened one packet but never played Dispatched with Royal Mail 2nd Class. Great game. Has over 100 cards. 3 x yellow, 2 x blue and 1 x red mouthpiece. Also has 2 x plastic bobs for when you spray it. The box has signs of wear. Ages 16 and up For 4-5 players. Note: Use mouthpiece only as indicated in the instructions, and remove from mouth after turn is over. Box Contains. So small tears to the seal but unused and new. see photos. For 4 to 6 players. Take turns in spinning the spinner to find your fate, will it be your turn to pick an egg?. Hasbro Speak out Party Board Game (C2018). Condition is New. Dispatched with Royal Mail 2nd Class.